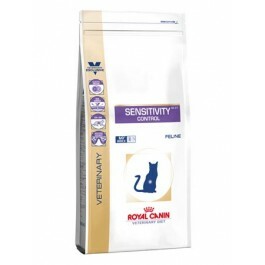 Royal Canin Veterinary Diet ranges are precisely formulated for specific needs. Please speak to your vet about these products and only feed them to your pet if your vet has recommended to do so. Sensitivity Control is a complete dietetic feed for cats formulated to reduce ingredient and nutrient intolerances. - A limited number of protein sources helps reduce the risk of food allergies. - Fatty acids to help maintain a healthy digestive system and healthy skin. - Nutrients which support a balanced digestive system. COMPOSITION: rice, dehydrated duck meat, vegetable fibres, hydrolysed poultry proteins, animal fats, rice gluten, minerals, fish oil, soya oil, marigold extract (source of lutein). ADDITIVES (per kg): Nutritional additives: Vitamin A: 24900 IU, Vitamin D3:800 IU, E1 (Iron): 40 mg, E2 (Iodine): 2.8 mg, E4 (Copper): 9 mg, E5 (Manganese):54 mg, E6 (Zinc): 202 mg, E8 (Selenium): 0.1 mg - Preservatives - Antioxidants. ANALYTICAL CONSTITUENTS: Protein: 27% - Fat content: 11% - Crude ash: 9% - Crude fibres: 6% - Per kg: EPA/DHA: 3.5 g - Essential fatty acids: 34.4 g.